At our annual family dinner to celebrate the end of another school year each of our children reflected upon the lessons learned and the obstacles overcome during the previous ten months. Our seventh-grade daughter, who will be referred to by the top-secret code name of Miffy, shared with us a new pedagogical strategy and use of educational technology not yet conceived of during my school years. What was this innovation? Was it project-based learning, multiage collaboration, constructionism, online publishing, modeling and simulation? No, it was Disney films. Yup, that’s right. Disney films (and several others too). The following is a partial list of the films shown this year during class time by my daughter’s teachers. I know by now that you must be marveling at the interdisciplinary nature of The Nightmare Before Christmas. You may also be wondering why there were no movies shown during fifth period. That’s because they don’t show movies during lunch. Now I’m as fond of wasting time and goofing-off as the next guy, but Miffy was able to remember watching at least 34 films having no educational value whatsoever in one school year. In case you were thinking that they could be studying film criticism or visual storytelling you should know that they only watched half of most films because the periods are too short. Others were watched over several days. This remarkable waste of class time occurred in a school where requests for meaningful projects, hands-on experiments, field-trips, drama and other productive learning experiences are abandoned because of an oft-repeated “lack of time.” Sure the standardized tests and top-down curricular pressures wreak havoc with creating a productive context for learning, but we can’t blame this one on Princeton or the President. Somewhere along the line educators determined that the demanding curriculum was elastic enough for the illegal showing of countless commercial films. Miffy also told me that due to the SAT-9 exams, “Career Day” had been cancelled. I’m not sure which part of that statement is most tragic, so let’s state it in the form of a standardized test question. The hosts of the series, Maya, Megan, Zooby and Josh (there always seems to be a Josh) introduced exciting career options for the high-tech interconnected global economy of the 21st century. The career options included the following: Snake handler, projectionist, naval explosive expert, skydive instructor, rafting instructor, diamond cutter, roller coaster technician, exterminator, auctioneer, alligator wrestler and my personal favorite growth industry – rodeo clown! You can’t make this stuff up! 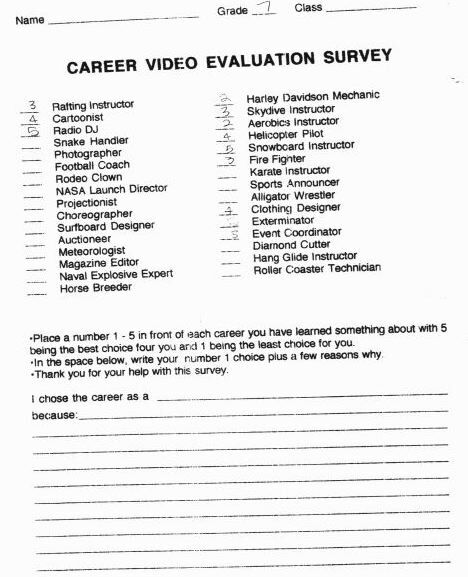 The worksheet that followed the Career Day substitute asked each child to rank these careers in order of preference and write a few sentences explaining their number one choice. If I wanted my children to watch television, I’d let them stay home. At least at home they could watch something educational like “Behind the Music: The Mamas and the Papas”or learn about Beat poetry from the “Many Loves of Dobie Gillis. ” At least then they would have a chance to learn something more than the unfortunate lessons being modeled by their schools. Notes: *My kid explained that all of these films share the same plot about a group of fat kids working hard together to win the big game. Somewhere in there’s a lesson for us all. Veteran educator Dr. Gary Stager is co-author of Invent To Learn — Making, Tinkering, and Engineering in the Classroom and the founder of the Constructing Modern Knowledge summer institute. He is also the curator of the Seymour Papert archive site, The Daily Papert. Learn more about Gary here.